The scale of forestry clearance as part of efforts to restore Europe's largest area of blanket bog peatland has been revealed in a photograph. RSPB Scotland director Stuart Housden tweeted the image of fir trees cut down on the Flow Country, which covers large parts of Caithness and Sutherland. He said enough trees had been felled for 260 timber lorry wagon-loads. Forestry plantations are being removed from areas of the Flow Country to help restore the blanket bog. 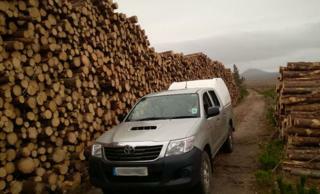 The timber is taken to a factory in Invergordon in Easter Ross where it is turned into fence posts, pallets and fuel. The Flow Country extends to 494,210 acres (200,000ha). Earlier this week, the Scottish government launched an £8m fund to help restore Scotland's peatlands. The restoration work will help reduce the country's greenhouse gas emissions by locking carbon into the environment. It is estimated there are 1.7 million hectares of peatland in Scotland, much of which is eroding.